This set of IC Engine Question Bank focuses on “Disadvantages of Two Stroke Engines”. 1. High speed two stroke engines are ____________ efficient owing to the reduced volumetric efficiency. 2. With engines working on Otto cycle, a part of the mixture is lost as it escapes through the exhaust port during scavenging. 4. Part of the piston stroke is lost with the provision of the ports thus the effective compression is less in case of two stroke engines. 5. Two stroke engines are liable to cause a ____________ consumption of lubricating oil. Explanation: Two stroke engines are liable to cause a heavier consumption of lubricating oil while in four stroke the consumption is less. 6. With heavy loads, two stroke engines get heated due to excessive heat produced. 7. At light loads, the running of engine is not very smooth because of the __________ dilution of charge. 8. Which of the following engines will have heavier flywheel than the remaining ones? Explanation: The flywheel in a four stroke petrol engine is heavier than in a two stroke petrol engine and there is no flywheel in a diesel engine. 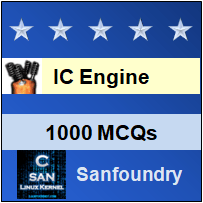 To practice IC Engine Question Bank, here is complete set of 1000+ Multiple Choice Questions and Answers.